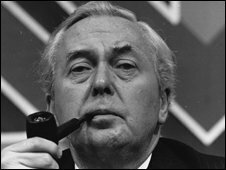 Harold Wilson drew up a secret plan - codenamed Doomsday - to end British rule of Northern Ireland at the height of the Troubles, the BBC has learned. It was previously assumed the Labour PM was fully committed to rescuing a power sharing deal in April and May 1974. But papers unearthed by Radio 4's Document programme suggest he was working on a more radical alternative. He wanted to cut all constitutional ties with Northern Ireland and turn it into an independent dominion territory. Northern Ireland residents would still be subjects of the Queen but - unlike other dominion territories around the world - the independent state would not be a member of the Commonwealth. The plan was detailed in the so-called "Doomsday document" - drawn up by Wilson after the collapse of the Sunningdale agreement - an attempt to end the Troubles by forcing unionists to share power with nationalists. It would have been the most radical and controversial solution to The Troubles ever attempted by a British prime minister and, the programme suggests, Wilson was serious about making it a reality. "The prime minister set up a small secret committee of officials, on which I sat, in order to pursue this idea," said Lord Donoughue, head of Number 10's policy unit at the time. "It was also certainly talked of - I don't know if they met - a small secret group of Cabinet ministers to discuss this. I remember him saying that unfortunately we couldn't include the home secretary, Roy Jenkins, because the details would leak to the press. Wilson was always obsessed with the fact of leaks, which was very odd because the home secretary was responsible for security and IRA activity." Lord Donoughue said the plan showed a "radicalism that you would not normally associate with Harold Wilson" who probably saw it as part of his policy legacy. Mr Wilson was angry about the Loyalist paramilitary-led strike crippling the Province, aimed at sinking the Sunningdale Agreement. He was later criticised for not using the army to break the two-week Ulster Workers' Council (UWC) strike and rescue the agreement, bringing an end to hopes of peace for a generation. It was assumed at the time that he was committed to saving the power-sharing Executive, despite having inherited Sunningdale from the previous Conservative government and being privately convinced it was doomed. But the programme reveals that in the weeks leading up to and during the two-week strike - which brought the power sharing Executive down - Mr Wilson was working on his secret plan. A leading Loyalist from the time Glen Barr, who helped lead the UWC strike, says there would have been civil war had Mr Wilson gone ahead with it because Loyalists would have assumed there would be a take-over by Dublin. "It would have been civil war - no doubt. Because there would have been such a chorus from the Unionists...and we probably would have had an invasion from the Irish side," he tells the programme. Garret Fitzgerald, the then Irish foreign minister who would go on to be prime minister, says if that had that happened the 12,000 strong Irish army would not have been able to deal with the resulting backlash from avenging Loyalists. "We guessed that it would lead to chaos but we had a difficulty - if we tried to prepare for that by increasing the size of our inadequate army to protect us from that chaos, that action would have been seen by Unionists as threatening to them," Mr Fitzgerald told the programme. He said the Irish government had not been aware of the secret Wilson plan, but they were worried he was planning something like it. "I think our state was more at risk then than at any time since our formation," he added. The plan eventually faded from the picture in 1976, helped by a 1975 meeting between the Irish leadership and British Foreign Secretary James Callaghan alerting him to the potential dangers.